This Routledge Classics edition includes a new foreword by the author. ‘An excellent and very welcome guide to psycholinguistics…highly recommended.’ The Washington Post A classic in its field for almost forty years, The Articulate Mammal is a brilliant introduction to psycholinguistics. 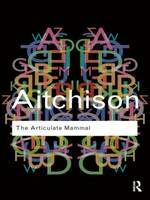 In lucid prose Jean Aitchison introduces and demystifies a complex and controversial subject: What is language and is it restricted to humans? How do children acquire language so quickly? Is language innate or learned? She explains the pioneering work of Noam Chomsky; how children become acclimatized to speech rhythms before birth; the acquisition of verbs; construction and cognitive grammar; and aphasia and dementia. She also considers new topics such as language and evolution and the possibility of a ‘language gene’, bringing the field right up to date. Jean Aitchison was Professor of Language and Communication at the University of Oxford from 1993 to 2003, and is now an Emeritus Professorial Fellow at Worcester College, Oxford. She is the author of numerous books on language and gave the 1996 BBC Reith lectures on the topic of ‘The Language Web’.